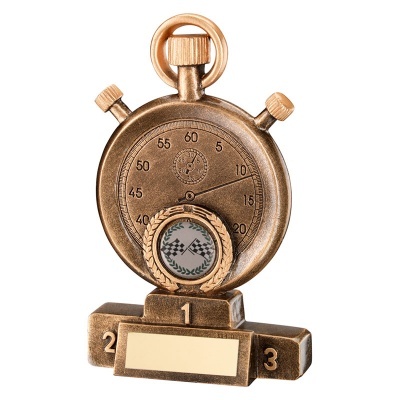 These motorsports stopwatch trophies are suitable for a wide range of motorsports events and prizes. Crafted in durable resin, they feature a detailed figure of a stopwatch with a 1in motorsports theme centre at the foot, and set on a winner's podium style base with metal engraving plaque. They are 7in (178mm) tall and are offered with low cost engraving of the base plate.